A couple of things this week reminded me of one of the first rules I spell out when I am giving PR or social media advice to a client: ‘never criticise the competition’. One came up today with Microsoft’s launch of the Xbox One, and the other is a pattern of behaviour I’ve been following on Twitter which culminated in a pair of tweets yesterday. There will always be exceptions, but by-and-large there is nothing to be gained by attacking the opposition – unless you are in politics. You are diverting the attention away from what you are there to talk about; you are giving your competitor publicity without having to lift a finger; and most readers will take what you are saying with a very large grain of salt – you’re hardly the independent observer, are you? Case in point is the headline in today’s AustralianIT: ‘Microsoft Xbox One to target Telstra’s T-Box market’. While I don’t think Microsoft or its spokesperson mentioned the T-Box in this instance, it’s the sort of outcome you can expect if you do call out a specific competitor. Much more directly to my point about never criticising the competition was a series of to-and-fro on Twitter resulting from an IT vendor’s launch of a product recently that seems to have caught its competition napping. I was involved in the launch here in Australia, so I’ve been following the Twitter chatter in relation to the product, and these two tweets from yesterday (pictured below) perfectly encapsulate the concept. I’ve blurred the identities of all three players involved, but let me take you through it. 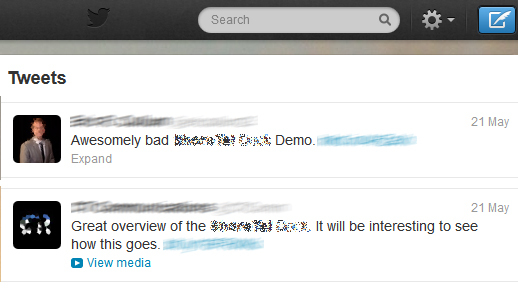 The first tweet is from one of the vendor’s integration partners, starting “Great overview…” Not long afterwards it’s followed up by the tweet “Awesomely bad <blurred-out product> Demo.” What’s funny is that both tweets point to exactly the same YouTube video. I took a look at the profile of the second tweeter, which gives no clue as to his employer. A quick Google search reveals that, as expected, he works for one of the launch vendor’s main competitors. So, if you are thinking about reacting publicly to a competitor, it’s important that you stop and think for a minute before you do it. Just remember that it’s not politics and, unless you are the founder of the company or the inventor of the technology, there is usually no ideological high-ground for you to take. You’ve probably chosen the company you’re working for based on a combination of one or more factors – including salary, employment conditions, corporate culture and reputation, the challenge, career opportunities and professional development . And, given the amount of churn in the IT sector, it’s quite possible that, in a couple of years’ time, you will be working for the competitor that you were criticising. It’s a completely different proposition to switching political parties.